SWEET SAVINGS FOR A NATURALLY RADIANT COMPLEXION! With over 40 years as the leader in the marine skin care, Phytomer is now a pioneer in the field of marine biotechnology, the future of results-oriented cosmetics. This is the newest technology to create innovative, 100% natural skin care ingredients. Based in Saint-Malo, France and distributed in 70 countries worldwide, Phytomer has a reputation of leadership and expertise within the spa industry. With Phytomer meaning “plant of the sea,” we utilize seawater, seaweed or seaside plants in every retail and professional product, combining science with the natural powers of the sea. Alcohol free and infinitely gentle, Phytomer's ROSÉE VISAGE Toning Cleansing Lotion removes makeup and tones without leaving a film. The skin is clean, supple and velvety. Alcohol-free and infinitely gentle, Phytomer's ROSÉE VISAGE Toning Cleansing Lotion removes makeup and tones without leaving a film. The skin is clean, supple and velvety. This delicately scented gel concentrates the benefits of marine plants to gently cleanse your hair. Supple and light, hair regains all of its shine. This unctuous conditioning care concentrates all the effectiveness of marine plants to restore hair suppleness and lightness while facilitating styling. Detangled, the hair regains softness and shine. 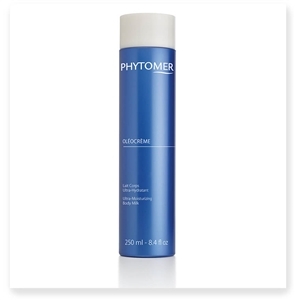 Phytomer's Purifying Cleansing Gel removes impurities and excess sebum leaving skin perfectly cleansed and purified. Dermatologically tested. Phytomer's HYDRA ORIGINAL Thirst-Relief Melting Cream, through Phytomer's advanced research, is a way to reinforce the skin's water reservoir with an original duo of marine Weaving Algae and Glasswort Oil. This deliciously rich cream delivers intense and lasting hydration for comfortable, visibly plumped, and radiant skin. Phytomer's HYDRA ORIGINALThirst-Relief Melting Cream, through Phytomer's advanced research, is a way to reinforce the skin's water reservoir with an original duo of marine Weaving Algae and Glasswort Oil. This deliciously rich cream delivers intense and lasting hydration for comfortable, visibly plumped, and radiant skin. This impressive facial cream has a smooth velvety finish and beautiful fresh fragrance, leaving skin feeling smooth, plump and visibly younger-looking. Biotechnology formula to create a "second skin" serum. This luxurious concentrate offers skin a new texture, restoring its original radiance. This 2-in-1 cream for face and eyes protects and repairs the skin from damage caused by urban pollution: dehydration, signs of fatigue, dark spots and dull complexion. It has a refreshing sorbet texture and intensely moisturizes the skin, restoring all its freshness. Day after day, signs of fatigue fade away, the complexion is more even and dark spots are less visible. Phytomer's PERFECT VISAGE Gentle Cleansing Milk delicately penetrates skin to gently eliminate makeup and impurities. Skin is clean, radiant, and comfortable. A fresh, light cream that gently removes makeup and eliminates impurities. Skin is clean, soft, and comfortable. Phytomer's PERFECT VISAGE Gentle Cleansing Milk delicately penetrates skin to gently eliminate makeup and impurities. Skin is clean, radiant, and comfortable. Phytomer's HYDRA ORIGINAL Non-Oily Ultra-Moisturizing Fluid, through Phytomer's advanced research, is a way to reinforce the skin's water reservoir with an original duo of marine Weaving Algae and Glasswort Oil. This ultra-light silky fluid delivers intense and lasting hydration for luminous, visibly softer, and smoother skin. On contact with water, SOUFFLE MARIN Cleansing Foaming Cream transforms into an airy foam and delights the skin with its fresh, delicate fragrance of white flower accords. Phytomer's PIONNIÈRE XMF range introduces a rich cream texture that transforms into a fine and lightweight foam on contact with water. Fresh and refined aquatic scent of floral notes of rose and jasmine. and delights the skin with its fresh, delicate fragrance of white flower accords. 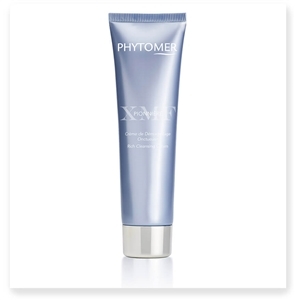 Phytomer's smooth, creamy VEGETAL EXFOLIANT efficiently removes the dead cell layer without abrasion. This exfoliant is adapted to even the most sensitive skin. It eliminates impurities and refines the skin's texture. Phytomer's smooth, creamy VEGETAL EXFOLIANT with natural enzymes efficiently removes the dead cell layer without abrasion. This exfoliant is adapted to even the most sensitive skin. It eliminates impurities and refines the skin's texture. 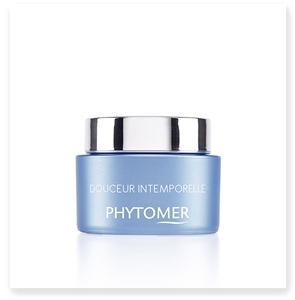 Phytomer's Souffle Marin Energizing Oxygenating Serum is a breath of pure air. This fresh, light serum offers skin all the benefits of the sea. 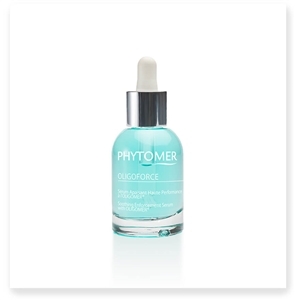 Phytomer's high performance OLIGOFORCE Soothing Enforcement Serum helps to sooth sensitive, irritated skin by strengthening the skin's natural defenses. PHYTOMER reveals the secrets of perfect moisturizing with OLÉOCRÈME Ultra-Moisturizing Body Milk: an ideal combination of the comfort of a cream and the lightness of a body milk. 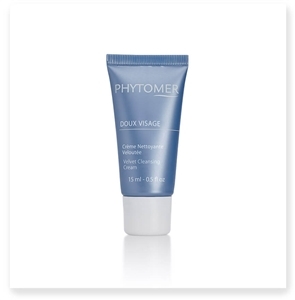 Phytomer's Seaweed Soap gently cleanses and eliminates dead skin cells, uncovering soft, supple skin. With over 40 years as the leader in marine skin care, you're sure to be satisfied by the results-oriented products you'll find within the Phytomer collection. When you browse our list of products, you'll discover a wonderful line of Phytomer creams, cleansers, gels and more. The word "Phytomer" means "plant of the sea," which makes perfect sense as we utilize seawater, seaweed or seaside plants in every product. This mixture of marine ingredients allows us to truly harness the combined powers of science and the sea. These Phytomer products originated in Saint-Malo, France, and are now distributed in 70 countries worldwide. This expansion has given Phytomer the chance to earn the reputation of being trustworthy and effective within the spa industry. Shop with LeSpa USA today to get your fill of all things Phytomer online! You'll be glad you made the investment in your skin and yourself. Spend $100 or more and you can even get access to free shipping!